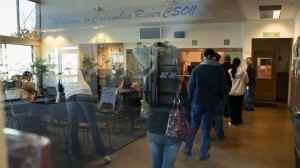 Unemployment: the problem | Audio and video stories from Southwest Washington. Unemployment rates in Clark County have fallen from 11.2 % to 7.6% over the last year. According to the Employment Security Department of Washington State, Clark County has 187,830 residents working, while over 15,000 are unemployed. In part one of a three part series, COUV.COM talked with three unemployed Clark County citizens who describe their experiences looking for work.